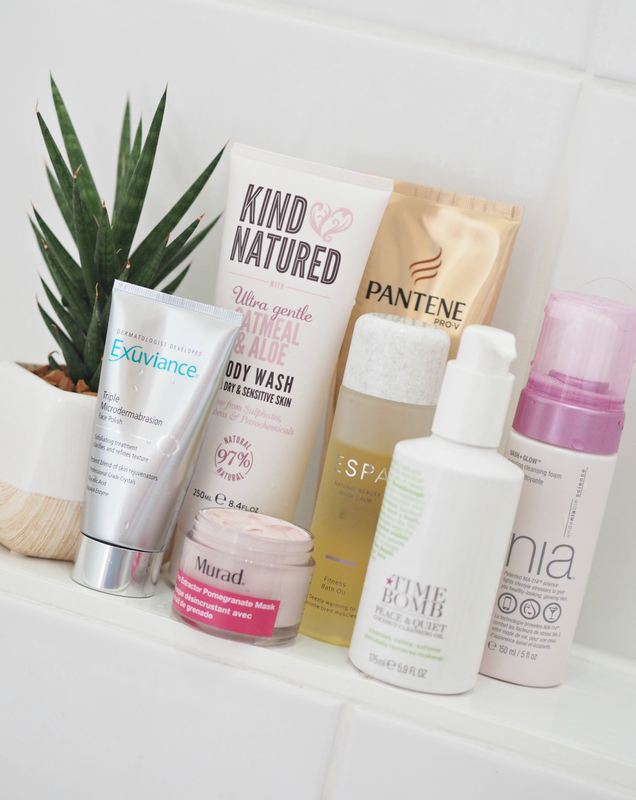 Often we spend so much time, money and effort on our skincare and makeup regimes that we often overlook the potential of products lingering on our bathroom shelves. A great body wash, face mask, hair treatment or bath oil can make all the difference, even if they’re not necessarily the most exciting or filled with the latest technology – if anything, most of our bathroom essentials haven’t been upgraded for decades. However, that doesn’t mean there’s not pleasure to be found and products to be enjoyed; little swaps or additions can make all the difference and ensure our bathrooms are a place we want to be. 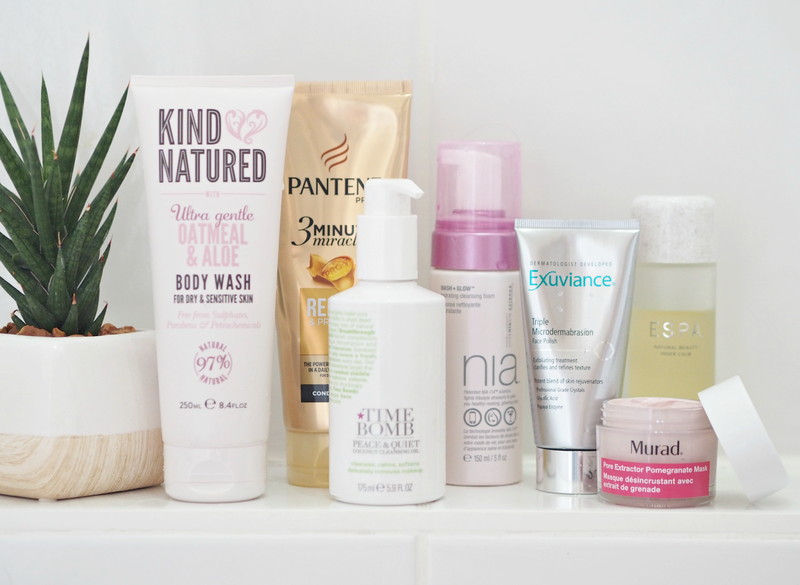 On that note, here are some of the bits and bobs I’ve been enjoying and think are worth lingering in front of the bathroom mirror a little longer for! Not the most exciting thing in our bathrooms, body wash or shower gel often leaves a lot to be desired; it’s functional and often a bit too much for our sensitive morning senses, but that doesn’t mean there aren’t some great affordable alternatives out there. 97% natural and free from Sulphates, Parabens & Petrochemicals, Kind & Natured is light and delicately fragranced while being enriched with some great ingredients – including comforting Oatmeal and soothing Aloe to leave skin feeling cleansed but conditioned. I love the scent and the way it makes my skin feel, plus it’s a fiver! I’m definitely a bit of a shampoo and conditioner snob, thanks to my years working in hair care development, and Pantene is usually one of those brands I stay away from (because the formulas have historically been filled with far too much silicone, which leaves hair limp and dull over time) but this three minute conditioner has convinced me otherwise. It includes Panthenol to help strengthen, while glycerin conditioners help to smooth the surface and leave hair feeling nourished; although it’s not a product I’d use every wash, when I need a little helping hand and my hair is looking exceptionally dull it’s a quick boost that works a treat. skin feeling and looking fab. Twenty quid for a face wash may seem steep, but this has been in my shower for months and I’m still not even half way through. The sulphate-free non-foaming cleanser helps to gently wash away impurities without stripping skin, thanks to its light foam (created by pumping in air as it’s released from the pack) that feels like a treat every morning. It contains NIA-114, a patented molecule that fortifies and protects skin against the impact of lifestyle stressors, Murumuru Butter Extract to gently cleanse and soothe skin while helping to lock in moisture, Olive Extract to provide essential fatty acids for skin hydration, soothing Chamomile and antioxidant Goji Fruit Extract. So a touch more than your usual Neutrogena then! Developed specifically for those in their 20’s that want effective products without the faff or added nasties, this is actually a great all-round face wash no matter your age. deeper to where they need to be. A wise buy. 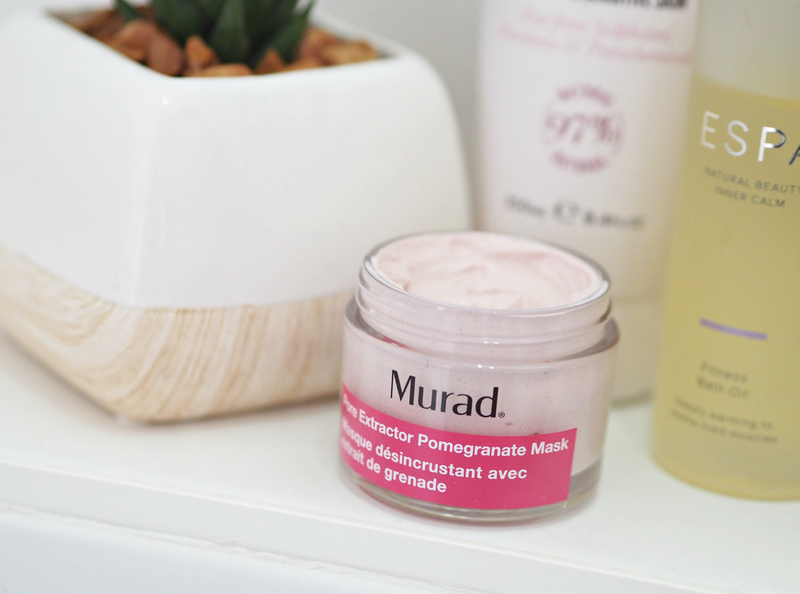 Undoubtedly one of my favourite skincare brands, thanks to their super effective products that deliver professional results, this ten minute pick-up from Murad is a welcome new addition to their range. The addictively scented formula extracts impurities and excess oil like a magnet, while Polylactic Acid polishing beads work to dissolve dead skin cells for a visibly refined surface texture; Pomegranate Extract promotes a brighter and more even tone, leaving your complexion feeling fresh, re-balanced and glowing. After ten minutes of this on my t-zone my pores are visibly reduced and my overall complexions smoother, making it a great morning pick-me-up or pre-event solution. I’ve been having all sorts of problems with my legs, back and shoulders in the past few months, thanks to a combination of long periods of time working at a computer and being a bit over-zealous in the gym. ESpa’s fitness bath oil is a great addition to my weekly bath-time, as the oils help to relax the muscles and mind simultaneously. Restorative Indian Bay and Clove Bud oils deeply soothe and relax, Lavender helps calm a busy mind, while Sweet Almond Oil deeply nourishes for beautifully soft, supple skin. Get in my tub! What products are you loving in your bathroom right now? Any treats I need to know about? Doesn't it! They have some great scents! Thanks for the lovely recommendation. I tried the oatmeal and aloe body wash and it's awesome. My skin feels smooth and soft after every wash. Since we are all on the same page,I would like to recommend Nyassa Divine Lotus Light Body Lotion. It compliments the body wash and i feel it's the best body moisturiser for dry skin.